It is estimated that up to 20% of your home’s energy is lost via the windows, giving true meaning to the phrase ‘throwing money out the window’. 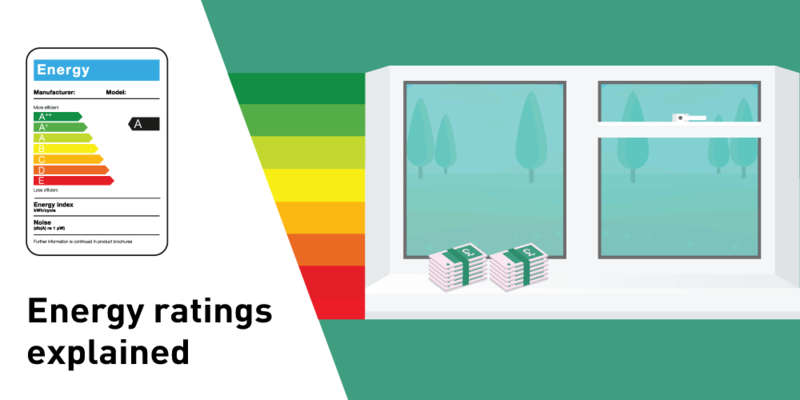 Understanding your window energy ratings can stop you getting caught out and landed with a hefty energy bill. In this guide, we’ll be helping you get smart about energy ratings, and covering how they can help you and your home. Window Energy Ratings (WER) is a system to determine how energy efficient your windows are; in other words, how effective they are at gaining and retaining heat. Similar ranking systems are found on electrical appliances and lightbulbs, with a ratings ranging from G – A+ (lowest energy efficiency to highest). When ratings are applied, they take into account the whole of the window – such as type of glass, design, and frame – and are not related to one sole component. These ratings are calculated by using a formula that incorporates several considerations, including how well the window retains heat, the U-value, and the amount of solar energy that can pass through the glass. WER labels typically consist of a rainbow display of the 7 available energy ratings, and will highlight the rating that has been given to that particular window. Ratings D – G are awarded to lower quality windows that have reduced energy efficiency. A + is given to windows with the highest thermal efficiency. Colours applied to each rating will differ depending on the rating scheme body that has rated that specific window. Some labels will display the Energy Index which describes the Kilowatt Hours per square metre per year. The higher this number the better; positive numbers mean energy is being gained. Since October 2010, all windows being installed must have at least a C rating. Companies, such as Abbey Glass, that are registered with a Competent Persons scheme will ensure that all windows installed will comply with Building Regulations. What type of Window should you Choose? One technique to make your windows more energy efficient is to add more layers of glass. This can be achieved by investing in double and triple glazing, which adds extra insulative layers of air or inert gas in between the glass layers to boost thermal efficiency. Low-emissivity coatings are now standard practice under building regulations and help prevent heat from escaping by reflecting it back into the home. Investing in these types of glass can reap rewards in the future by increasing the Window Energy Rating and saving you money on energy bills. Skilled installation of the window is vital to ensure decent window performance. A poorly installed product will be a hindrance to its effectiveness and energy efficiency, so make sure you get specialists on the job. The team at Abbey Glass have over 40 years’ experience as professional glaziers, both crafting and installing numerous energy efficient glass products for homes and businesses alike. Offering free quotations and a quick turnaround on all jobs, Abbey Glass should be your first port of call for any glazing job. We provide double and triple glazing, along with glass replacement, glass cutting and crafting of multiple glass products. Get in touch today to find out how we can help you.